A federal court judge has dismissed a lawsuit by the Freedom From Religion Foundation and three local plaintiffs against a Texas justice of the peace who imposes prayer at the beginning of court sessions. 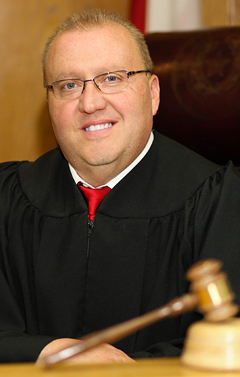 FFRF and three plaintiffs directly affected by Montgomery County Judge Wayne Mack's religious rituals, filed suit in March 2017 naming the judge in his official capacity and Montgomery County. U.S. District Court Judge Ewing Werlein, Jr., for the Southern District of Texas in Houston, issued a ruling yesterday. The court dismissed the case based on standing (or right to sue), not on the merits. Werlein said FFRF could not sue Mack in his official capacity, then dismissed FFRF's claims against Montgomery County, saying the County has "no power to stop Judge Mack from employing the prayer practice to which Plaintiffs object” because the Texas Constitution establishes county commissioners courts. Werlein dismissed the case without prejudice, meaning FFRF can refile the case, naming Mack in his personal capacity. “This decision does not bless Mack’s unconstitutional actions, or in any way get him off the hook,” explains FFRF Co-President Annie Laurie Gaylor. She said FFRF will study the decision and confer with local plaintiffs who continue to be injured by the prayer practice, to decide how best to remedy the violation. Both of the attorney plaintiffs have appeared before Mack multiple times on official business, including “Jane Doe,” a Christian who "objects to a government official telling her when or how to pray" and John Roe, a self-employed attorney who regularly represents clients in front of Mack, who "is religiously unaffiliated and objects to being subjected to religious prayers" in a courtroom. Mack, as Montgomery County justice of the peace, has jurisdiction over minor misdemeanor offenses and lesser civil matters. Montgomery County is north of Houston, and its county seat is Conroe. All three of the individual plaintiffs felt compelled to remain in the courtroom during Mack's prayers at risk of jeopardizing their cases and careers, or their clients' cases. Mack, a graduate of the Jackson College of Ministries, where he majored in theology, ran for justice of the peace in 2014 on a platform of reinstituting religious values within the office, partly by implementing a chaplaincy program. He established a volunteer chaplaincy program involving “visiting pastors” who start each of his court sessions with prayer, within his first weeks of office. The guest chaplain often reads or sermonizes from the Christian Bible, then asks all attendees to bow their heads and pray. All prayers witnessed by the plaintiffs have been Christian in nature. FFRF first sent a complaint letter to Mack in 2014 asking him to cease his courtroom prayers, receiving no reply, then filed a formal complaint with the Texas State Commission on Judicial Conduct, whose investigation lasted over a year. In November 2015, the commission declined to discipline Mack, citing lack of authority but cautioning Mack to end or substantially change the practice. FFRF and its plaintiffs are being represented by FFRF Associate Counsel Sam Grover, with FFRF Associate Counsel Elizabeth Cavell serving as co-counsel. Attorney Patrick Luff of the Luff Law Firm in San Antonio, is serving as local counsel. FFRF has more than 32,000 members, including more than 1,300 in Texas. Read more about the case.